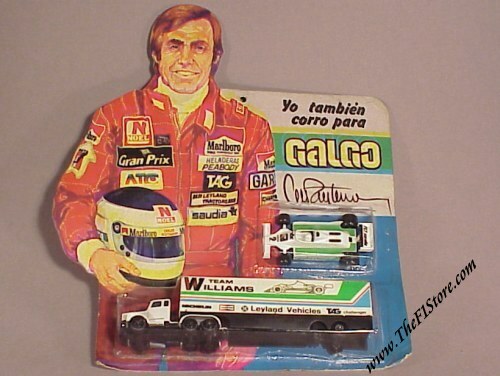 Vintage 1981 Carlos Reutemann Williams F1 car + Williams Truck on blister card. This is an ultra scarce set made by Galgo of Argentina. Reutemann is hugely popular in his home country (he is the governor of Santa Fe) and not many of these sets make it abroad and even in Argentina itself it is a pretty scarce find. The contents of the set comes in scale 1/64 and is 1 x Carlos' 1981 # 2 Williams FW07C and 1 x a Team Williams GP truck with Michelin, Champion, Leyland Vehicles and TAG sponsoring. The models are dead mint, the card is near mint (some knocking to the lower corners).